*plonk! * Here´s the next Bergen dates and a pretty picture thanks to Kenny Muir! (all upcoming event dates are in my calendar too of course but i also like pretty pictures). The Herosalen event is called “Space is the Place” (of course inspired by one of my fave artists/musicians/dudes Sun Ra) and there’s an event on facebook with more details what to “expect”! The art + yoga / kunst + yoga event at KODE is focusing on the exhibition “The Needles Eye. Contemporary Embroidery” – more deets here! looking forward to returning and reuniting!!! 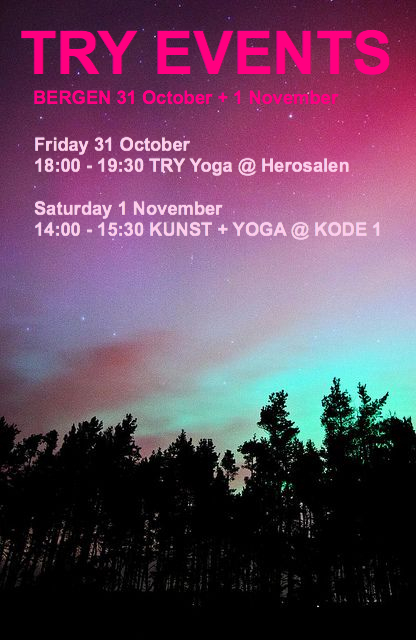 This entry was posted in art + yoga, Bergen Barneasyl, news, schedule, workshops & events and tagged art + yoga, Bergen, herosale, KODE Bergen, kunst yoga, Norway, norway days, space is the place, sun ra, yoga Bergen, Yoga Everywhere, yoga with dionne. Bookmark the permalink.